ISLAMABAD: Germany has put its weight behind Pakistan’s peace overtures to India, acknowledging ‘there is a conflict in Kashmir’, that requires a peaceful solution. This was stated by German Foreign Minister Heiko Maas while addressing a joint news conference with Federal Minister for Foreign Affairs Shah Mehmood Qureshi on Tuesday. Maas was on a visit to Islamabad where he also called on Prime Minister Imran Khan. Speaking at the news conference after holding formal talks at the Foreign Office, the German foreign minister appreciated steps taken by the government of Pakistan, seeking de-escalation in tensions with India. Maas particularly mentioned Prime Minister Imran Khan’s peace overtures — including quick release of Indian pilot Wing Cammander Abinandan, who was captured after his warplane was shot down by PAF jets on February 27. The dogfight happened a day after Indian fighter jets violated Pakistani airspace and dropped bombs in haste in Balakot. New Delhi claimed it targeted the terrorist camps run allegedly by the banned Jaish-e-Muhammad. Islamabad rubbished the Indian claims, an account that was also corroborated by many international media outlets as well as independent experts. The military standoff brought Pakistan and India to the brink of war. The foreign minister briefed his German counterpart on the Indian aggression against Pakistan’s territorial integrity, which was in violation of the international law. Pakistan responded in self-defence and acted with restraint, he said. The German top diplomat lauded Pakistan’s efforts and urged India to respond positively. He also acknowledged the crackdown launched by Pakistan against the banned organisations. He said terrorism was a common challenge and it required international cooperation. Asked to comment on the current situation in occupied Kashmir, Maas said he also spoke to Indian External Affairs Minister Sushma Swaraj on the Indo-Pak tensions. During the conversations, the German foreign minister said, he pointed out that ‘there is a conflict in Kashmir’ requiring a peaceful solution. The foreign dignitary appreciated Pakistan’s overtures towards normalising the situation through the offer of dialogue to India to resolve all outstanding issues. He added it was important that India should improve the situation in occupied Kashmir. “If there are human rights violations, if there are atrocities, then there will be a reaction and that reaction, at times, is difficult to contain,” Qureshi remarked during the news conference while referring to the current situation in occupied Kashmir. Prime Minister Imran Khan also echoed similar sentiments during the meeting with the German foreign minister. The prime minister urged the international community to take notice of grave human rights violations in Indian Occupied Kashmir. He said Pakistan had always favoured dialogue to resolve all outstanding issues — including the Kashmir dispute with India. 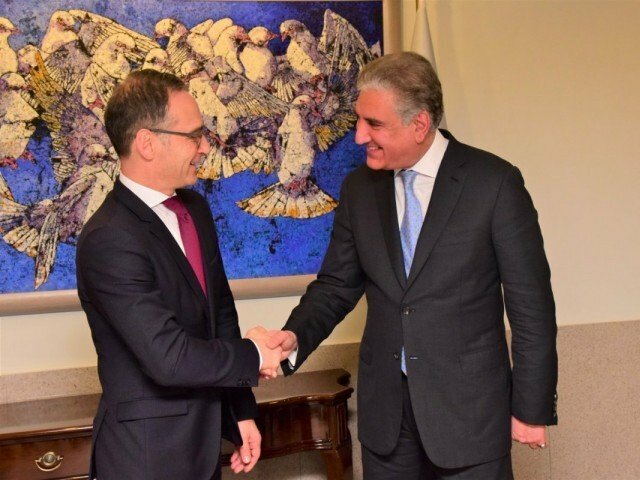 On fighting terrorism, Qureshi told his German counterpart that there was a consensus in Pakistan against this menace. He said the massacre at the army-run public school in Peshawar in December 2015 encouraged all political parties to develop a consensus against terrorism and extremism. Meanwhile, the Foreign Office statement said the two foreign ministers expressed satisfaction at the positive trajectory of bilateral relations and reaffirmed their commitment to strengthening cooperation in political, economic, trade and investment, and educational spheres. During the talks, the two sides discussed a wide range of bilateral and regional issues. The foreign minister welcomed the entry of German automobile producer Volkswagen into the Pakistani market and investment by Siemens in power generation and medical sectors. He also invited other German companies to take advantage of the investor-friendly policies of Pakistan. The foreign minister apprised his German counterpart on the positive role played by Pakistan in facilitating the ongoing talks between the US and the Taliban. He added that Pakistan had always advocated that there was no military solution to the Afghan conflict. A politically-negotiated settlement led and owned by Afghans is the only sustainable solution. Foreign Minister Maas agreed to work together for deepening of bilateral relations, especially in the field of trade and investment. He stated that Germany was supportive of people-centric agenda of the government in the fields of health, education, and human development, which was also in line with the German development programme. He also appreciated Pakistan’s constructive role in the Afghan peace process and steps taken by Pakistan towards promotion of regional peace and stability.